It’s the 5th of May and that means: Fan Friday! 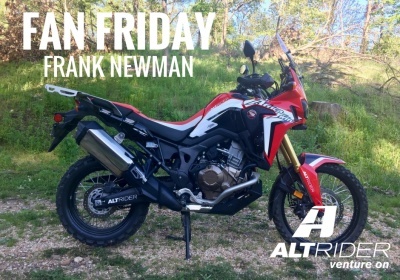 This week we talked to Frank Newman, 49, who you may know for his awesome Youtube videos (especially reviewing AltRider products). As an electronics engineer from Exeter, MO., Frank has been riding for 41 years and is the current proud owner of a 2016 Honda Africa Twin, which he uses to explore the back roads around the great state of Missouri. Frank has a ton of AltRider products on his bike, including AltRider’s Skid Plate, Center Stand Skid Plate, Dual Control Brake System, Rear Luggage and Pillion Rack and Lower Crash Bars. He’ll be installing the complete crash bar system when it becomes available in just a few weeks. “I love all the parts. My YouTube channel and bike are both 100% devoted to AltRider,” said Frank. And for that – we thank him! Frank usually rides the back roads and forest of the Ozark Mountains, and dreams of one day joining AltRider at our annual Taste of Dakar event. Keep up the awesome videos Frank and as always, venture on!